Are June Bugs Poisonous to Animals? June bugs, also known as June beetles and May beetles, are reddish-brown bugs who begin to become prevalent in the spring. Cats love to chase them, and dogs eating them as crunchy snacks. While the bugs themselves are not toxic or harmful to animals, eating too many of them can lead to gastrointestinal upset, including diarrhea or vomiting. 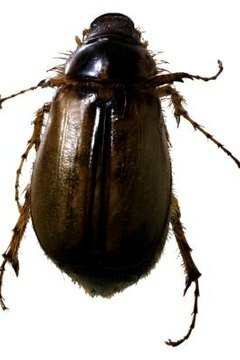 June bugs are most abundant during the warm spring and summer months. They are often attracted to light. Their sometimes frenzied activity attracts pets to them. Dogs and cats may chase the bugs for fun and eat them as an afterthought. The bugs don’t typically present a hazard in terms of biting, stinging or scratching; on their own, they are not dangerous to ingest. June bungs have the potential to become toxic, not because of their own internal chemistry but because of the insecticides many homeowners use to eradicate them and other common pests. Chlordane, DDT and Lindane are common ingredients used in insecticides. A dog, cat or bird who eats June bugs that have been marinated with these chemicals can become ill because of the poisons. This usually occurs only if your pet finds a wealth of dead bugs and eats them all. Keep an eye on your pet when he’s outside during summer evenings. June bugs are usually active at night. If you walk your dog under streetlights, the bugs are sure to be a tempting attraction. Leash your dog and guide him away from June bugs, and don’t let your cats out at night to help limit the amount of bugs they catch and potentially ingest. Keep the June bugs in your own yard toxin-free by using a pet-friendly insecticide or a natural pest removal remedy. This is better for your pets overall, as animals can absorb dangerous chemicals from common lawn and yard-care products through the pads of their feet. Additionally, chemicals can flow into groundwater -- if your pet drinks from shallow puddles in the yard, he could inadvertently ingest toxins.